We can tailor fit a hunt to the size of your party on either the James River utilizing our customized jetboat (complete with folding blind) or on one of our exclusive farmland leases. Razorback Guide Service has exclusive hunting leases on over 2,700 acres of farmland in the Central Virginia area. About half is planted agricultural fields-mostly corn. After the corn is cut, resident and migratory geese come from all over to feed on the scraps. As you might image, the action can get hot! Because we have so much land under exclusive arrangement, we can rotate the fields to keep them from getting shot out. This allows us to get those call shy birds into the deeks for some awesome action. Liberal bird limits and a very large resident flock make Central Virginia a hot spot for some of the best Goose hunting in the Mid-Atlantic states! The James River in this area is a favorite resting place for many resident and migratory waterfowl. Besides geese, we have harvested numerous species of duck to include: woodduck, mallard, black, redheads, teal, gadwall, and pintail to name a few. Utilizing our customized jetboat complete with folding blind, we can cover a large amount of the river to locate the birds and then setup to hunt. 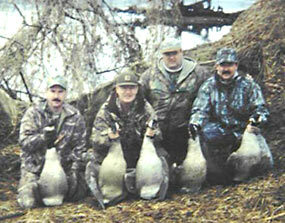 This type of hunting is the favorite for most small hunting parties due to the scenery of the James River. When weather conditions are best, the shooting can be fast and furious! The ultimate outdoors experience! We will float the James River fishing for trophy smallmouth bass while constantly glassing ahead for ducks or geese. Once we locate a flock, in come the fishing poles and up goes the folding blind. We will then float into the flocks - jump shooting! This is the best of both worlds this area has to offer and a favorite for many of my repeat customers!